Blockchain should be integrated into application for loans and insurance industry, believes Stefano Virgilli, CEO at VOX. Stefano Virgilli is the ICO advisory expert. 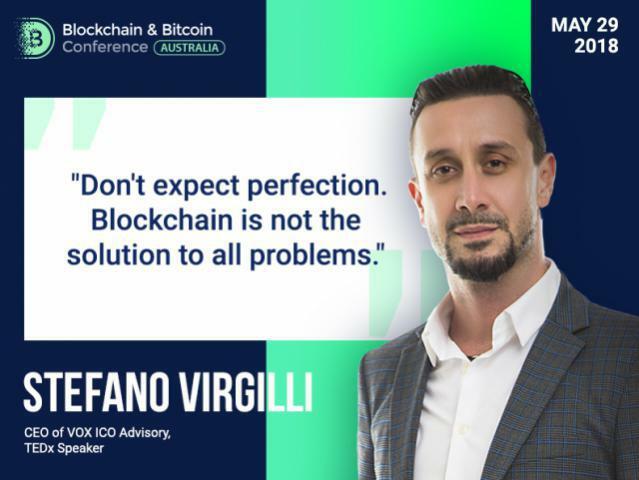 He will be a speaker at the Blockchain & Bitcoin Conference Australia, delivering a presentation “How do I explain blockchain mining to a 6 years old.” In the interview, Stefano Virgilli discussed blockchain security, mining regulations and mining pools scams. BCA: Speaking about mining regulations, do you think they can be beneficial in any way? SV: It depends entirely on the will of the government. When it is beneficial or not – it’s for the government to decide. My best guess is that the government would be able than to track the profits and revenues generated by miners, and being able to tax them accordingly. So, yes, from the government perspective, it is good to regulate the mining process, so that they can take control over the tax value of it. BCA: There is a discussed issue about different websites using people’s central processing units to mine coins. To which extent is this the problem and how to recognize that this is happening? SV: There are certain ways to take advantage over someone’s else processing power by injecting malware and taking control over what to mine remotely on someone’s else computer. There is also another type of scam that takes advantage of electricity power bills, air conditioning and Internet connection. With small devices like this one, someone is able to enter one of those premises that are open 24/7 and plug it into air conditioning system, so it always will be cold there. It’s very small, it doesn’t process many transactions in terms of hash per second, but an interesting thing is that it is easy to conceal and very cheap to produce and purchase. It costs around 20 EUR, but it breaks quickly, even when working at a slow pace in terms of mining. So, if you own one of that 24/7 facility for mining, make sure you don’t have a number of such devices plugged into your mining premises. BCA: Except for the financial sector, what spheres would benefit from blockchain integration? Are they making steps towards this trend? How successful are they in it? SV: When it comes to the grows of blockchain inside a financial sector, I see a huge potential for the industries that require validation. One, for instance, is insurance. I see it as one that lag behind, probably for a little bit too long. When you are applying for life insurance, everything is based on trust: you say that you don’t have insurance condition, and the agency will take it as a fact, provided that you don’t have to go for a medical examination. Even if you go for a medical examination, and you’re rejected from one insurance, there is no traceability of your inability to apply for an insurance in another country, or it is not so clear and obvious, not so transparent. I think in such a case all the transactions could happen on blockchain. When it comes to a financial sector, applying for a loan is pretty much the same story. When you’re applying for a loan, you are asked about your salary, your employment records, any liabilities or any other loans. This process may take from 2 to 3 weeks, depending on the country you live in, but with blockchain it could take literally one second to process this type of information. BCA: Recent studies have shown that around 3.5% of blockchain smart contracts are vulnerable to attackers. So, is blockchain really as secure as people think? SV: Well, about hacking and scamming on blockchain, it all point down to the very foundation of what the scam is. In 90s, for instance, the vulnerability is looked at from the chances of entering into the systems. 20 years ago and up till the last year, firewall was in charge of preventing external party of entering the system, because once they get into the system, they can do whatever they want. Blockchain is very different: they have to bring in all the memories of the other blocks, if they don’t do so, they don’t have a chance to do anything, even after entering the system. In other words, if I enter my neighbor’s property and I pretend to be my neighbor, the wife of my neighbor will be pretty sure that I’m not her husband. Not because of the way I look, even if I look exactly as my neighbor – she will be able to validate my existence based on memories that she has, and I’m not able to recall them. So, even if the door is open all the time, I will not be able to “hack” that system, because it is based on memories. Blockchain works the same way. So, when we look at the scams, vulnerability – generally it is when someone is taking advantage of one single fact, which is end transaction: entering a password, transferring the money to another wallet and it is the end of the story. In terms of vulnerability now, the common practice is always to establish third-party assessment, especially for ICOs: the idea that smart contract is designed by one team and assessed by another team. BCA: Do you have any tips on how to identify cloud mining scams and how to understand whether some mining pools are profitable or not? SV: It is very difficult to understand what the scam is, because scammers are becoming cleverer, and also because if you look into the history of hacking mining pools, some of the hacks even very large ones, for example heists, were not really a hack, technically speaking. Someone logged into the system using password of one of the engineers, bringing us to a point whether it is a hack or a scam, and how to identify the two of them. It is really complex. It points down being a person taking advantage of the vulnerability: it is no longer IT vulnerability security, but simple log in. Meet the speaker and find out more information at the conference!